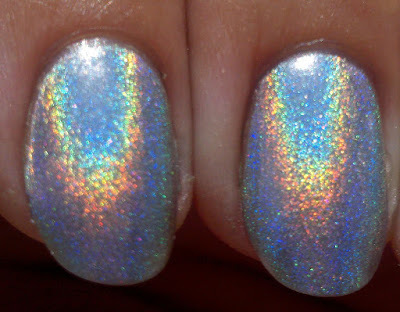 We interrupt the ChG OMG Collection to bring you a very special holo! 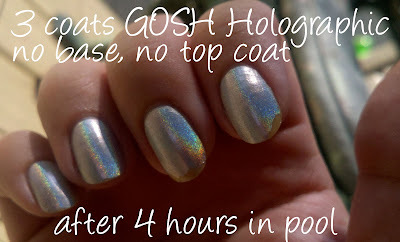 Ladies and Gentlemen (or just ladies) May I introduce... GOSH Holographic! 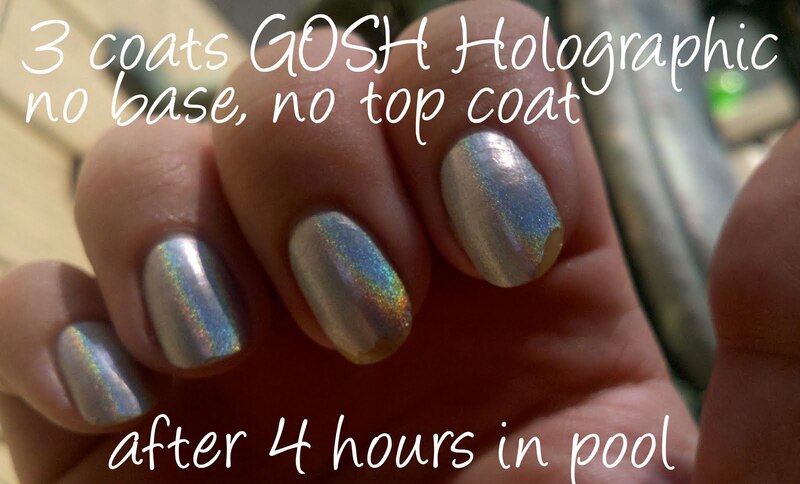 GOSH (which can be purchased in parts of Europe and Canada) Holographic nail polish has a bad rap. Even before I received it I had heard horror stories about how bad the application was. So I decided to try something different. On my right hand I applied my polish as normal, with three coats of GOSH Holographic. 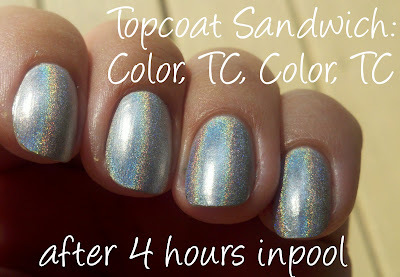 On my left hand I used the topcoat sandwich method. I first heard about this method on MUA, and it was used to extend the life of matte or suede polishes. The key is to use a very thin topcoat. For this mani I used Color Club Vivid topcoat. 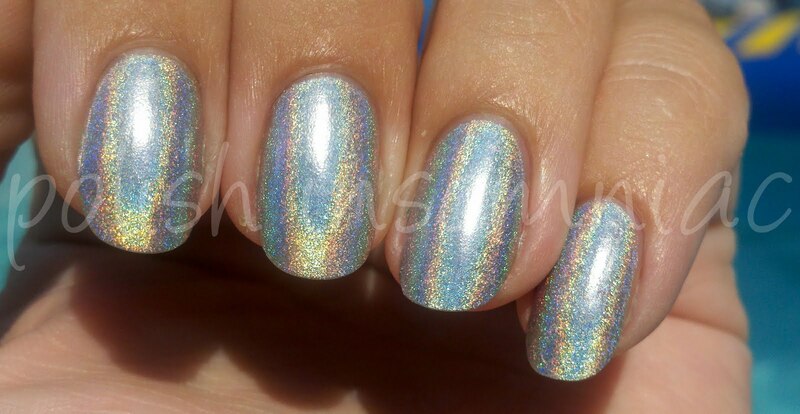 So here is 3 layers of color and two layers of topcoat sandwiched in between. I put it to the ultimate test - 4 hours in the pool. And here is the right hand. Sorry it is not the best picture, it is practically impossible to take a picture of my right hand with my new phone. 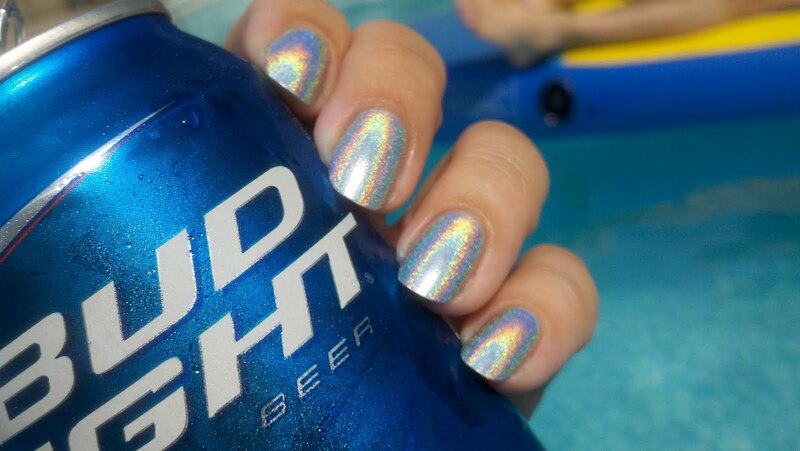 You can see that there are significant chips on many of my nails. So the next time you wear a holographic nail polish and you want it to last more than a day, try a topcoat sandwich!